A blue-bound copy of Emerson’s essays, 50 cents, and the clothes on her back were all that Miss Rose Host had with her when she stowed away aboard the Panama Pacific liner “Manchuria” bound for Los Angeles. If Capt. William J. Munroe hadn’t been so understanding and hadn’t allowed her to earn her passage by stamping passenger forms for the ship’s purser Leo Gallagher, she may never have made it. Rose’s picture appeared today in the Los Angeles Times accompanied by a story about her Hollywood dreams of gold and fame. A beauty contest winner in her home state of New York, Rose believes that a successful career in tinsel town is within her grasp. Fast forward six months. 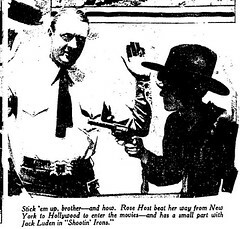 Rose landed a bit part in the film “Shootin’ Irons” with Jack Luden. See – that’s Rose in the photograph, nothing more than a silhouette. Her part was so small she wasn’t even mentioned in the credits, and her Hollywood dreams ended with one picture. Rose Host the actress was not heard from again. Maybe she became an English professor, sharing her love of Emerson with idealistic undergraduates. Let’s hope so, because when a Hollywood dream becomes a nightmare you have Jack Luden’s story. Jack and Rose were both in their 20s when they made “Shootin’ Irons” together. Jack was an heir to the Luden’s cough drop fortune, but he was young and it was Hollywood so he tried his hand at acting. He was a handsome guy and Paramount planned to feature him in westerns as they’d done with Gary Cooper. Unfortunately for Jack, “Shootin’ Irons” wasn’t a success and by 1930 the studio had either dropped him or he’d walked away from his contract to pursue a life as a junkie. How he spent the years between 1930 and 1936 remains something of a mystery, but by the 1940s the thrice married Luden had a monkey on his back the size of Cheeta on steroids. He drifted in and out of the movie business – and trouble, for the next decade. During those six lost years Jack evidently acquired a taste for the seamy side of life. Busted several times for shoplifting to support his heroin habit, he was known to have said "a crooked buck is sweeter than an honest dollar." Jack, it seems, was an unrepentant sinner. Finally in 1951 he was sent to San Quentin for drug possession and passing bad checks. Nine months into his sentence Jack dropped dead of a heart attack. He was 49.